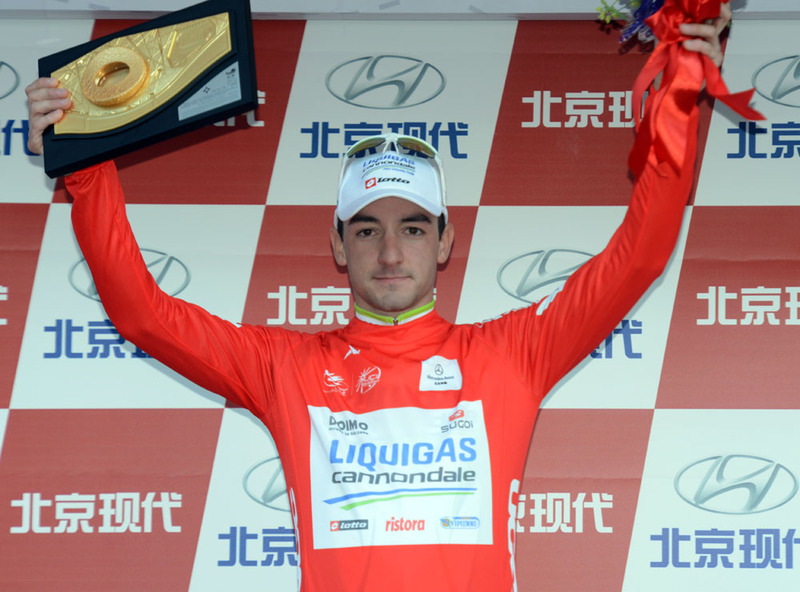 Elia Viviani (Liquigas-Cannondale) took the bunch finish at the end of the opening stage of the 2012 Tour of Beijing on Tuesday. British rider Andy Fenn (Omega Pharma-QuickStep) placed second, with Edvald Boasson Hagen (Sky) in third behind the 23-year-old Italian. An earlier five-man escape group consisting of Craig Lewis (Champion System), Marco Bandiera (Omega Pharma-QuickStep), Matthieu Lagadnous (FDJ-BigMat), Adriano Malori (Lampre-ISD) and Pim Ligthart (Vacansoleil-DCM) was shut down by the bunch on the penultimate lap of the race, which in total comprised 12 laps of a 7.8km circuit. Sky Brit Alex Dowsett launched a late attack in the final two kilometres of the race, upping the pace of the bunch to assist team leader Boasson Hagen. Dowsett was caught in the final kilometre, and with no one team dominating the run-in to the finish, the sprint turned into a free-for-all with Viviani showing he had the turn of speed to take the victory. Viviani wears the leader’s jersey going into Wednesday’s second stage. The five-stage Tour of Beijing – the final race in the 2012 UCI WorldTour calendar – concludes on Saturday, October 13.